Today I read a very interesting article in Horse&Hound by Harry Meade. It focused mainly on Bertram Allen getting disqualified at Olympia last year (read about what happened here) and Harry’s opinion on the situation. This article made a really interesting point that welfare in equestrian sports is suffering due to public perception of welfare in the sport taking priority. He made the point that during cross country and eventing, a horse can be pulled up if blood is seen and inspected by a vet. If the vet believes there is no welfare issue to the horse, then the horse is allowed to carry on. However, in show jumping and showing, any sign of blood (or mark) leads to disqualification, no matter how insignificant the injury may be. The reason behind this rule is to protect animal welfare and so that they are seen to be doing something about animal welfare in their sport. However, Harry went on to make a very good point. He said that in high profile cases like Bertram Allen’s disqualification, officials and those reporting can only say he was disqualified for welfare reasons, or complain about the welfare rules. Both these things will eventually reflect badly on the sport as a whole, due to the activity on social media. The non-horsey public, especially those who disagree with equine sports, jump on these cases saying the horses are treated terribly and the riders beat and abuse them. So when the horsey public then argue that the rules are too strict, this makes the industry as a whole look like we do not care about the welfare of our horses. So how can this be resolved? The most obvious way to resolve this would be to change or re-examine the disqualification rules so that only significant injuries or possible welfare cases are disqualified from competition. Not only would this improve how these situations go viral on social media, but it will also be putting the horse’s welfare first. But with our televised sports under a lot of pressure from the public to improve horse welfare, I am unsure how likely things are to change soon. It really was a good article. If you get this weeks Horse&Hound, do read it. It may also be on the Horse&Hound website if you have a look. I think i’ve never heard such a load of rubbish. As a decidedly “horsey person” I don’t think enough is being done for horse welfare full stop. Especially in eventing. As a decidedly horsey person I also believe eventing will eventually be phased out (pun intended) as an equestrian sport and certainly as an Olympic sport. Exactly because of the real welfare issues involved, not perceived ones. They might act as the catalyst for its banning or exclusion. As an owner I would never concede to allowing a horse of mine to be used as an eventer. Not in a million years. Nor will I allow a horse to travel by air more than once in it’s lifetime and the destination had better be the Olympics! Harry Mead is saying less care is needed so less horses get disqualified in Jumping to bring it up to eventing “standards” so the public aren’t alerted to welfare issues that don’t exists. He is wrong. This is irony surely. What Harry Mead doesn’t seem to grasp is with social media the public are acting as the whistle blowers, indipendantly. Did the FEI ever have a problem with “rollkeur” in dressage and jumping before the public began voicing their strong disapproval. No. Did riders? Generally also not, even if they weren’t using the same on their horses. The same with draw reins…….The public don’t need to be sparked by news of a disqualification. However the more disqualifications there are would indicate rather more real welfare issues in a sport, so a change of direction could be called for rather than a change in rules for disqualification in the mis guided thinking it will subdue the publics scrutiny. Harry Mead is also wrong to look at things from the point of view of “them and us”. Nothing self regulates very well, it’s a natural conflict of interest. The public are as qualified to recognise a welfare issue as anyone, if not more so as they don’t have the pressures of trying to win on a horse and please sponsors. They are the eyes and the ears of our sport and we should respect that and embrace it whole heartedly. A horse is an animal like any other. You just have to respect animals to be qualified, and respecting animals is the mark of a civilised society, not reserved for the few on horse back whose over riding ambition is to win ribbons for sponsors. Remember the public and the FEI don’t get to see what happens at home, so every minute detail of a horses welfare should be intensely scrutinised when it can be. In this regard there should most definitely be spot checks at home on a regular basis too. Equestrian sports are not fully regulated at all. Isn’t time there were?! There are many riders themselves who say the FEI is not capable of monitoring welfare issues, exactly because of conflict of interest, that it should be an independent body that does the job. I agree and would welcome as much scrutiny as possible. Seeing the FEI in action at international events I agree completely. At the Longines in Hong Kong I saw exactly one very elderly lady taking a few swabs from horses legs. Riders, trainers, owners and sponsors need to be on the right side of animal welfare not opposed to its effective implementation, not withdraw into the closed dark holes we operated in before where even the public were excluded from warm up arenas. Where real monitoring is nothing but a ceremonial function. Openess is key to solving welfare issues and ensuring that all horses are happy healthy and relaxed and willing in all spheres of our sport. Something I as a horsey person do not yet see. There is work to be done and never time for complacency. The question stands why should eventers get less welfare care than Jumpers, not why shouldn’t jumpers get the same lax attitude found in eventing. Surely! I agree with the fact that more can be done to improve welfare in all equestrian sports, but the point in this post is that the industry is acting to improve welfare not for the horses benefit but for the sports. Because in my opinion, if a caring rider loses balance over a big jump and nicks the horse with his spur, this is sad for the horse, but it isn’t abuse. It was an accident. However, if the rider had been really pushing the horse and over using his spurs and nicked the horse, that would be abuse. I think the point Harry Mead was making is that horse welfare is a issue which needs to be addressed. But at the same time, the system they have in place can catch out good, innocent riders. I also disagree with you thoughts on eventing. I see no more abuse or welfare issues in eventing than any other sport. Well that’s the point isn’t. Harry Mead is going on the assumption that spurs are a given. That they don’t pose a danger to a horse. If a horse can get injured by so called “mistake” what conscionable rider would wear them in the first place. My horse could get inured in the heat of the moment , oh thats Ok as long as I win and am not penalised. Right? It would take all the risks out of the equation if no one used spurs at all. Thats taking welfare seriously not trying to play with nuances of penalties. Mead is not worried about the horse at all. Your opinions that eventing is less of a welfare issue than any other equestrian sport is baffling to say the least. When last did you see a horse having to be shot for injuries sustained in the dressage arena. Compared to the show jumping arena many many more horse sustain serious injury and death in eventing. Eventing puts the horse in danger, asks it to risk its neck with every jump. This is not a welfare issue? The only other equestrian endeavours that comes close is hunt racing and the criminal wastage in endurance riding and flat racing. I dont however see those even as equestrian “sports” except for endurance riding they just pure abominations and should go the way dog racing has in Australia. Banned. Yes there are serious welfare issues in equestrian sports, none should be taken less seriously than the other I agree. But on a sliding scale its patently obvious some sports are more of a welfare issue than others. Everything we do puts our horses at risk. 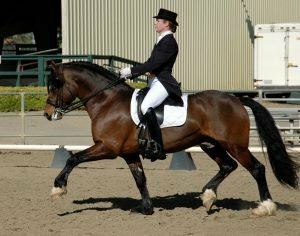 What about the dressage horses who get terrible hock arthritis? And the show jumpers who break down? It might not be as instant as an injury in the cross country phase but it can be just as life threatening! If you take your horse out hacking, you are putting it at risk. 21 horses have been killed on the roads in the UK in the past year. Should we all stop hacking too? Just in case? What if our horse misjudges a pole work exercise at home and trips and falls? That can still be a serious injury. Ylusing a bit we are risking hurting and irritating the mouth. What if the horse trips and you pull the reins by mistake. How many horses get back problems from the saddle they are wearing? If you really want to remove all the risk from horse riding to improve welfare, you wouldn’t ride. So wanting to ban one really useful bit of tack just in case is a silly idea. Yes event horses are more likely to suffer a sudden serious injury which means they are pts so they won’t suffer. But in the long term, an event horse will be no worse off than any other horse. Its cognitive dissonance that allowed riders to put their horses in needless risk nothing else. Surely yes, sitting on a horses back is not a right, horses didn’t evolve with saddles and riders on their backs. We do have to make sure we do everything in our power to make that as pleasant for a horse as possible. Throwing a horse around the countryside at speed, over obstacles that cannot fall, over ditches and through jumps in water where the whole aim of the course is to eliminate riders is frankly outrageous. Now of course if everyone was getting safely home that would be different but they’re not are they? So yes absolutely horses are being asked to fall, put their necks on the line. Dressage is not without its problems welfare wise either no. I agree horses shouldn’t ever have to do things like piaffe pirouettes in order to come in the top three. Its too much to ask of a horse, its become a circus. The aim of dressage is being lost. Far as im concerned a horse should just be able to do a couple of steps in perfect piaffe in balance, rhythm, perfect contact, poll at the highest point and be able to do so smoothly and elastically, transition in and out, and thats that. Its the transition and piaffe that should be marked not a horse going up and down on the spot turning circles for as long as it can tolerate. Joints cannot take that kind if abuse. Having said that very few dressage horses come out of the arena lame. And none actually get killed in the process like eventing. Its degrees of welfare, where there shouldn’t be any at all. Spurs are not a useful bit of tack. They’re instead a useful bit of force. The crap about them being an extension of the leg is just yet more cognitive dissonance and needs to be exposed for what it is. A sharp piece of metal jabbing the horses sides. Disqualifying riders for actually breaking the horses skin is simply not good enough is it Mr Mead et al, never mind trying to reduce the penalty. Mark my words spurs will be banned eventually, riders should take the lead or they’re going to find themselves on the wrong side of public opinion and eventually the law. Already in some countries rules are being changed to allow riders to compete without them where they were obligatory in dressage for example. After all a test of obedience should mark their use down. Yes maybe riders shouldn’t be hacking on or near roads, our roads are busier and busier every year. Roads are not the place to be. This doesn’t happen on the continent, as they have dedicated bridal paths, through forests and safe areas. No one rides down country lanes thinking it’s safe anymore. Needless risk is not the same thing as an accident. Accidents will happen in any sphere of life. Where it’s in our control we owe it the horse to do our utmost to minimise such. Why do you think eventing jumps are being redesigned, because its so safe? Yea right. A few broke human necks seems the only motivation while the horse doesn’t even get an airbag. I think your issue is against any kind of equine sport tbh. If someone didn’t hack out due to having to go on the roads so schooled every day I bet that would be cruel too. Spurs are a useful aid. Especially at high level jumping where the horse needs a clear aid at the right time to help get the right stride and not fall through the jump. The same way that sometimes its better to have a stronger bit. Yes when used wrong they are bad. Yes there can be accidents which are sad. But the spurs aren’t the issue. And I’m worried about what spurs people you know use if you think they are sharp!! I don’t think they should be compulsory. But I do think they should be allowed when used correctly. As with every bit of tack we use on our horses. Perhaps you shouldnt be involved in any equestrian sport on any level. I’m patently not, Im a huge dressage fan but over the years I’ve become also a wiser fan of equestrian sport. Believe me I had no qualms about eventing as a young rider in my teens and even as a young adult. Yes I didn’t think twice. You don’t. You just go with what everyone does and thinks. Slowly however like a great hunter turned conservationist I saw things more from the horses side than the rider. The turning point came when a very good friend of mine was on a course and his horse had its entire hoof ripped off. So highly tuned and charged were both the rider and the horse they didn’t even stop until near the end. An accident for sure but had the jump been able to fall, dismantle, it’s hoof wouldn’t have become lodged and ripped off. Many years later and they are only now trying to redesign jumps, make courses safer. I’ve also seen some horrific abuse of spurs, truly terrible…..in Spain. Look the point is things change they must. We learn and move forward, we must. Teaching elephant trainers not to use a hook is a priority across Asia now. Teaching trainers to use positive reinforcement on calves instead of abuse. Why should horse training and riding be any different. Why should it stay still. Why should a double bridal be used in GP, its archaic and redundant. Seeing a grand prix rider pumping away with spurs to me is horrific, even if they dont draw a drop of blood. This is not positive reinforcement, in fact most riders or trainers dont use positive reinforcement at all in any way, they dont know how. Spurs should be redundant if a horse is trained well, and if not the horse is not suitable for what its being asked to do because then you enter the realm of force and abuse. Something which is very much evident even for most GP riders doing something as elementary for a GP horse as a piaffe, even if a small handful are managing not to, the majority are still abusing spurs to get a piaffe out of a horse. A spur doesn’t have to be sharp its a piece of blunt metal, focusing an aid over a tiny surface and is intended to be painful. I can ride just with my seat aids, the slightest move of my fingers, subtle shift of my weight, my legs hardly move……this is riding well. Having to use spurs is not riding well. Having to have every contraption known to mankind in a horse mouth is not good riding and its even worse training. There is no rule that every horse should even be ridden. Its kinder to be cruel crap. The number of times I’ve heard the most ridiculously insane anthropomorphising by riders about horses leaves me believing there is defiantly a huge amount of cognitive dissonance involved. “The horse hated retirement, couldn’t wait to get back to work”, “a horse needs a job to do” blah bah. A horse is happy being a horse and being allowed to be a horse end of story. The more we allow a horse to be a horse the happier it will be. Horses need turn out, they need to mingle with other horses. Its not been long since this wasn’t a given in fact for millions and millions of horses across the globe it still isn’t. But the awareness is there now and guess where this came from. Not from riders or anyone involved in the industry but from the public, that great unwashed unhorsey mob the spectator. Who also happened to be fans of the horse. This is shocking, we should be spear heading horse welfare not those not even involved. The FEI should be not members of the public with mobile phones. Its a good thing they are of course but its embarrassing hearing the reactions often from the top in the sport. Sven Rothenberger even suggested mobile phones should be banned from dressage warm up arenas!!! But watch now oh how careful riders are in warm up arenas…why weren’t they always and what goes on at home! Screaming and kicking we will be dragged into the 21st Century, if we lose public trust along the way and become a dying breed, excluded from the Olympics and relegated to a minority of lunatics we only have our selves to blame. I’m afraid I’m just going to have to disagree with you. I’m all for things continuely improving. But I see a use for spurs and would much rather someone correctly used a spur to lightly back up their leg aid than be booting the horse I’m the ribs. What you would prefer and the reality are very different. We can say spurs used “correctly”. But whose going to monitor that they are at home or in competitions. Does blood have to be drawn for them to be used incorrectly? What about large welts or rakes also not breaking the skin? Indeed what about riders who leave a large unshaved patch of hair to conceal such marks of abuse? The number of times I’ve seen show jumpers…..in fact very recently at the Longines Masters 2017 in Hong Kong I saw someone punishing their horse with spurs. It was Jacqueline Lai jabbing the horses sides horrifically after it refused the wall. Now it was an unusually wall as it had a large strange black area painted towards the bottom. Too cowardly to use her crop under the scrutiny of hundreds of eyes, the spectators, she jabbed the horses sides repeatedly and hard instead. Is this the correct use of spurs? The horse was eliminated as it wouldn’t jump. There was no bleeding. This is classic negative reinforcement at work. Jacqueline Lai now knows (hopefully) she has to get the horse used to such strange jumps. But meantime the horse has already been abused and in the most painful way at the riders means. Instead of seeing the problem taking him up to the jump and patting him and walking away she fucked up. She should have seen that jump when she did her walk and come into the arena on the horse past it and gone around it so the horse could’ve had a chance to see it wasn’t a giant black hole waiting to swallow it. A number of riders had a problem with that wall, the clever ones did exactly what Lai didn’t do and had no problems. Why should a rider have the means to abuse a horse at all. Should jumps be standardised to avoid abuse? Because its happening and riders are getting away with it. Blah blah? Simply banning spurs would take care of it, absolutely. If riders couldn’t use spurs in competitions they wouldn’t use them at home either, guaranteed. Besides the horses being bred to day have more and more blood in them and riding with spurs is simply trying to get more out of a horse than it can feasibly muster, which is force, which is sanctioned abuse. We will definitely have to disagree on this. But I hope you think twice before ever recommending spurs or using them yourself. The heat of the moment is no excuse for abuse. I think my biggest issue with what your saying is that any use of spurs is abuse. I very occasionally use spurs and have no problem in using them. I also don’t think keeping unclipped patches hides abuse. Instead I think it acts as a layer of protection so that the spur is less likely to harm the horse. Preventing any “abuse” rather than hiding any “abuse”. Over use of the spur doesn’t always leave a mark and correct use of a spur but a ln accident can leave a mark. And I don’t agree that not being able to use spurs in competitions would stop people training in them. I’ve never competed in spurs but I do train with them. Sometimes they are the perfect thing for a horse who ignores your leg aid. End of the day, spurs aren’t the issue. Its the odd rider who misuses them or has an accident. Yes its negative reinforcement but all training we do with horses in negative reinforcement. We apply a pressure, be it our legs or reins, and we remove this pressure when the horse does what we are asking. Whether you like it or not, unless you do clicker training, all horses are trained with “force”. That doesn’t mean we are all abusing our horses or that their welfare is at risk. Dave Miller on 5 things to do when you can’t ride.